If your blog posts aren’t attracting website visitors and readers, that’s a problem, right? Assuming your posts are well-written and the topics were developed to answer actual questions your customers and prospective customers ask, your problem may be right there under your nose. It could be that you are missing basic on-page SEO a.k.a optimized page content. No, you say, that’s a newbie mistake. No shame. It happens to the best and brightest. It’s like when you go to start your car and it doesn’t. You tell the Triple-A guy: I don’t know what’s wrong. It ran fine yesterday. The first question he asks is: “got gas?” Well, of course, you say, it…I… pffftt. Sometimes my clients want to do some of their own writing, and since they are the subject matter experts, I let them. Before I do, I walk them through this seven step on-page SEO checklist. This page optimization check list will help you write effective blog posts and web pages that will be findable in search. Or, if you outsource your writing, you’ll be better equipped to collaborate with your writer. Even though this is basic stuff, I use it all the time—and it makes a difference. Following these steps will put an SEO knockout punch into all your web writing. 1 Keyword focus. This two or three-word phrase is the subject of your blog post. It supports the purpose of the page—which is to answer a question that matches a search query by your intended customer. Include the focus phrase in the working title of your post if possible. It’s a good idea, once you have a working title, to do a little extra research. Type that title into your browser and see what comes up in the results. Has the subject been covered? Most likely it has. Click on some of the links to see how well it’s been covered. Then ask yourself: Is your angle into the subject going to contribute a fresh perspective? Good to know before you start. 2 Page title & meta description. Very important. Going back to the search you just ran. The items that populated that search engine return page are the page titles and meta descriptions of web pages that came up in answer to your query. This is your first opportunity to make an impression on your potential customer. So, you want your title and description to grab their attention. Make them choose you and click through to your web page. Technically speaking, you must keep your page title to less than 70 characters, and less than170 characters for the meta description. If you go over the character count, Google will cut you off. In both cases, you want to make sure your key phrase is toward the front end of the copy, if it’s possible to do so naturally. I love doing titles and meta descriptions because you have to make every word count. It’s a great writing exercise. 3 Header Tags. Include your exact keyword phrase in your first header H1 and in the first paragraph of the body copy. After that, use variations of the keyword phrase in one of your H2’s and let it reappear naturally throughout the body copy. This mirrors what you are doing with the title tag and meta description. You are signaling the search engine that: The topic of this page is X, and you can expect to find information that supports topic X in the body content of the page. 4 Body Copy. Good news here. “Keyword density” is out and “related words” are in. It used to be that we fussed over how many times to use a keyword phrase in the entirety of a post. We tried to come up with a formula that would justify using the exact keyword phrase x number of times per x number of words on the page. If you didn’t leave enough clues for the search engine, your page wouldn’t rank. If you over did it, you’d get slapped for spamming. Search engines have become much more sophisticated. They are much better at picking up on the fine points of well written content. In 2017, you can freely use natural iterations of the keyword phrase and topically related words throughout your body copy—because the search engines will get it. The new SEO aligns well with content writing and encourages the writer to explore the breadth and depth of a topic without having to slavishly repeat the exact key phrase over and over. What happens over time is that strategic internal linking makes your individual pages stronger because, linked together, they support each other–and that makes your website stronger over time as well. Rankings go up. Traffic goes up. Leads increase. Blogging is good for business. 6 Category and Tags. This is your filing system in WordPress websites. The category covers a broad topic area, and tags refine that further into subtopics. Select one category and input no more than two tags. In time, this will be a huge help with information architecture, making it easy for website visitors to find the information they want once your blog has accumulated significant archives. 7 Image Alt Attributes. Change the file name of your image from something useless like “DSC015331” to something that uses the keyword or at least references the topic. And write a three to five word alt tag that describes the image in terms of how it relates to the topic. So, that’s it for basic on-page SEO to improve the findability of your blog posts or web pages. There are other page optimization characteristics such as readability and user experience that contribute to effective web writing. I’ll cover those in a future blog post right here. Questions? Topic suggestions are welcome. Just PM me on Twitter. 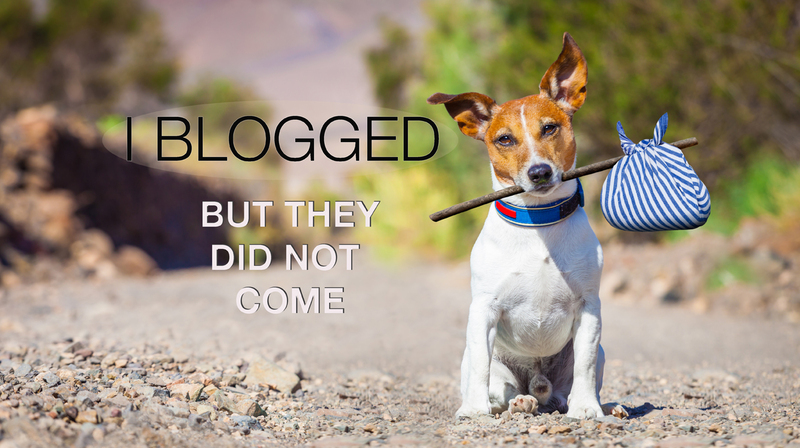 Why Bother With a Business Blog?